As teachers, we understand that time is precious and that's why Learners Edge has designed professional learning opportunities that you can complete from the comfort of your home. Whether you are looking for continuing education graduate credit or professional development hours, we have what you need. Getting Started on Your Professional Learning Order! Browse our Courses and pick your favorites. If you need help, reach out to our Learning Advisers who are happy to help! Consider which Session you would like for your courses. For those that need continuing education graduate credit: If you need an academic transcript upon completing your course, select a University/College partner (this is the University/College that will issue your transcript upon successful course completion). 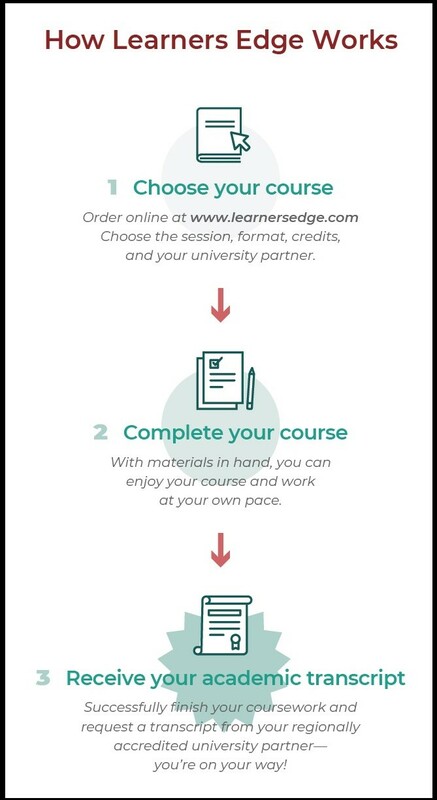 For those that need a Letter of Completion, Learners Edge professional development courses do not have an academic partner and no university transcript will be available upon course completion. Once you place your order, you’ll have access to your course(s) within 3 hours. Continuing Education graduate credit courses often have textbooks and we’ll ship your books the next business day. Professional Development courses are entirely online with multi-media resources embedded within the course. If you've enrolled in an online course, you can start exploring your course by logging into the online environment with your customer number and password. We encourage you to get familiar with the online course environment so that you are ready to roll when your textbook arrives in the mail (if your course utilizes a textbook). If you've enrolled in a print-based continuing education graduate credit course, you will receive your syllabus via email, your textbook will arrive via mail (typically 7-10 days is sufficient). When the postal carrier drops off your book, it's time to get to work! As you work through your course or courses, pay attention to the Session Due Dates! Coursework must be complete by the end of the session in which you are enrolled. If coursework is not complete, you will be dropped from the course. If you have questions as you work through your course, please reach out to our Instructors. They want to help you get the most out of your Learners Edge course and make sure it is applicable to your teaching environment! Once I'm done with my course, then what? You're done - Congratulations! You are well on your way to becoming Teacher of the Year! We get it - the most important part is accruing those graduate credits or hours so you can keep your teaching license in perfect standing or make that all important move on the salary schedule. 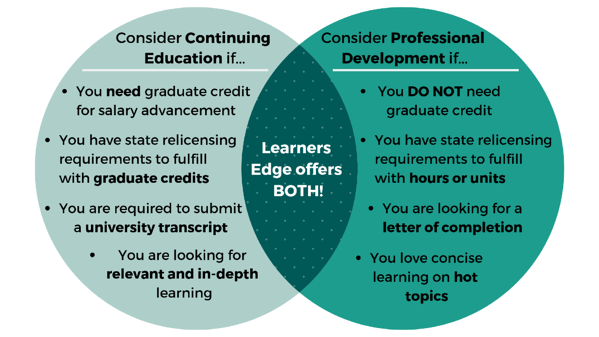 If you registered for Continuing Education graduate credits, when you registered for your Learners Edge course, you picked a University Partner, please visit their web page to understand and successfully complete the transcript request process for your unique university partner. If you registered for Professional Development, after successful completion of your course, you can login to your Account/My Edge Login and download your Letter of Completion. Login to Your My Edge Page Now!